Dreamtime is the only PADI affiliated dive center in Mahahual and has been offering diving here since 2005. We are an ecologically conscious dive operation and pride ourselves on being the safest, most forward-thinking dive center in the region. Dreamtime is a dive center with a philosophy built around diver safety, environmental protection, and FUN! At Dreamtime, we offer daily dive excursions, snorkel tours, and educational courses from Discover Scuba for first time divers to Assistant Instructor for the more advanced professionals. We also teach many of the specialties available under the PADI umbrella. Our front yard is the Meso-American Barrier Reef, the second-larger reef system in the world and stretching across four countries. This is the largest barrier reef system in the Northern Hemisphere, which runs from north to south, in finger formations - creating lots of canyons and swim-throughs. 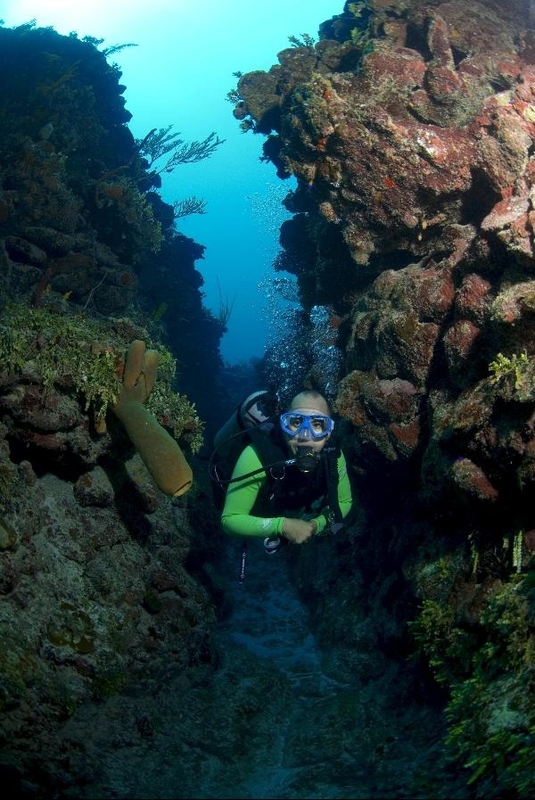 What does Dreamtime Dive Resort have to offer? • Organized dive trips, leave the planning to us! Although parts of the reef are between two and four million years old, most of the Costa Maya region of the reef has never been seen by a scuba diver! This area has some of the most pristine hard and soft corals in the world. The marine life is diverse and the visibility averages close to 100ft. We have a range of sites we choose from each day, depending on diver experience, desired depth, local conditions, etc. The reef is only a 10-minute boat ride from our resort. Below you will find a brief description of some of our favorites! Escalones means stairs in Spanish and the name of this site originates from the stepped appearance of the reef here. The reef is 40ft on the land side and steps down sharply to 90ft on the seaward side. There are often large schools of fish to see in the deeper water and lots of canyons to swim through looking for eels and lobster. Named for the forty Spanish cannons located here by treasure hunters. We start on the shallower side of the reef at about 40 ft and then swim up and down the abundant canyons (not canons!) that are here. This site is know for its breathtaking reef formations and abundant marine life. Named after the two oval sand patches located inside the coral reef which look like two giant eyes from the boat. This is a great site for beginners or those who need a refresher as it is relatively shallow (max depth 60ft). 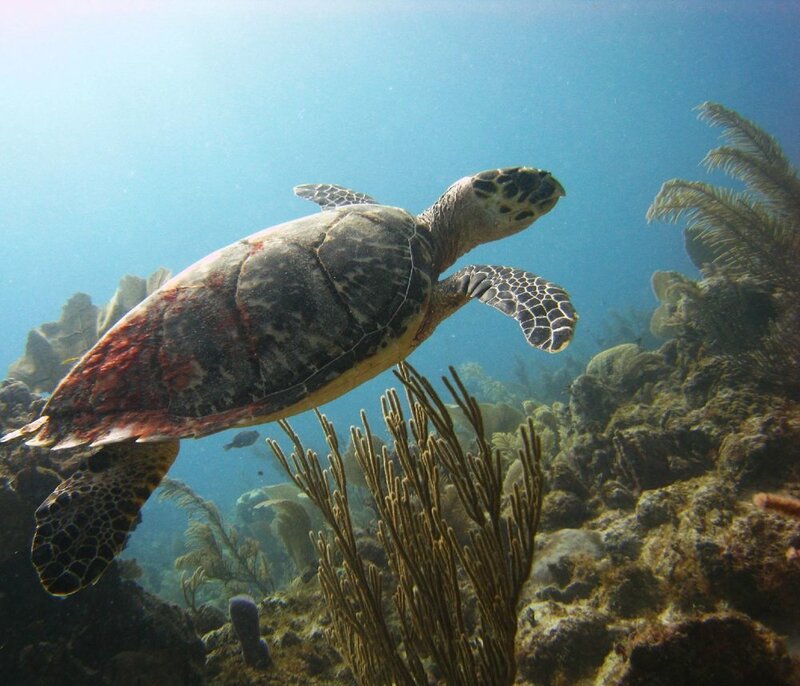 This site is a common hang out for sea turtles, rays, and lobster. Named for it's depth. The reef here starts at about 40ft and is made up of large fingers of coral which stick out into the deeper water where at the base of the fingers it is over 100ft. The dive consists of swimming around these huge fingers. Nurse sharks have been spotted here as well as eels, dolphins and larger fish such as groupers.